New! Video Clips from Mel's Nightclub performances! PLUS! Audio Clips from Current CD's! 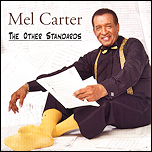 BRAND NEW CD "Mel Carter - The Other Standards"
"Mel Carter - The Other Standards" - Mel brings his personal touch and sound to some of the biggest hits - "Crying In The Chapel", "Cry Me A River", "Goody, Goody", "I'm Just Your Fool" ... 12 songs and 2 medleys from the heart of Mel Carter! "The Heart & Soul of Mel Carter"
"The Heart & Soul of Mel" - a personal musical journey which reflects the joy of remembering special moments connected with specific songs ... "Heart and Soul" ... "Cry" ... "Where or When" ... 12 cuts of quintessential Mel Carter! NEW VIDEO - "MEL CARTER LIVE IN HOLLYWOOD"
Features LIVE performances of "Hold Me, Thrill Me, Kiss Me," "(All Of A Sudden) My Heart Sings" and "You, You, You"
Bonus Track: "Star Spangled Banner"